The U.S. State Department refuses to give Pakistan $50 million in military reimbursements, claiming Pakistan creates "safe havens" for terrorists. 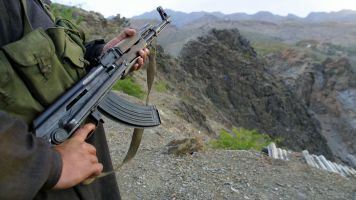 The U.S. won't give Pakistan $50 million in military reimbursements because the State Department claims the country is a "safe haven" for terrorist groups. Secretary of Defense Jim Mattis told Congress that Islamabad hadn't "taken sufficient action against the Haqqani Network" — a group closely related to the Afghan Taliban. This resulted in funds being withheld. Pakistani Foreign Affairs spokesperson Nafees Zakaria denied the claim, saying, "We have taken indiscriminate and all out action against terrorists." The U.S. has done this before. Last year, the Pentagon withheld $300 million. Those clawbacks come from the nearly $900 million the U.S. was supposed to reimburse Pakistan for its counterterrorism efforts in 2016. Pakistan has already received $550 million of that money.